First popular in the early 1800s as a parlor plant, miniature roses are a unique variety of rose that has been deliberately bred to grow to only 1-2 feet when mature. This tiny version of the ever popular rose bush makes a wonderful houseplant. Miniature roses are one of my favorite plants to grow indoors due to the beautiful flowers and attractive foliage, packaged up in a miniature bundle. So many things look more appealing in miniature form, and you can definitely add roses to this list. I’m delighted to write this article to help you with growing miniature roses indoors and to keep them looking great in your home. How Much Light Do Miniature Roses Need? Miniature roses thrive in bright sunlight, and will do best with 6-8 hours of direct sunlight per day. For this reason, I usually place my miniature roses close to a south or west facing window. 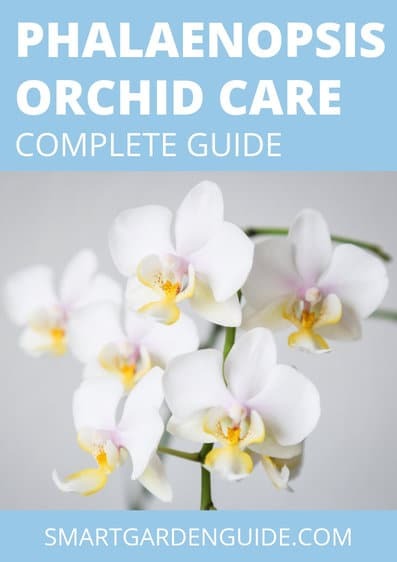 This is particularly important in the darker months of the year, when it can be harder to give your houseplants the light that they require. In the height of summer, a south or west facing window can get very warm and so I tend to move them farther from the window to limit the heat exposure for the plant. Another option is to move your miniature roses outside during the summer. They can look really attractive on a patio among other potted plants and provide a glorious display of color while you enjoy the summer sunshine. I’ve had best success with miniature roses when I keep them outside for the 3-4 hottest, brightest months of the year, and bring them indoors for the rest of the year. Sufficient light is probably the most important thing to focus on when growing miniature roses indoors, so get this right and the rest is easy. It’s generally a good idea to rotate your miniature rose every 1-2 weeks, so all areas of the plant are receiving similar amounts of light and growing symmetrically. 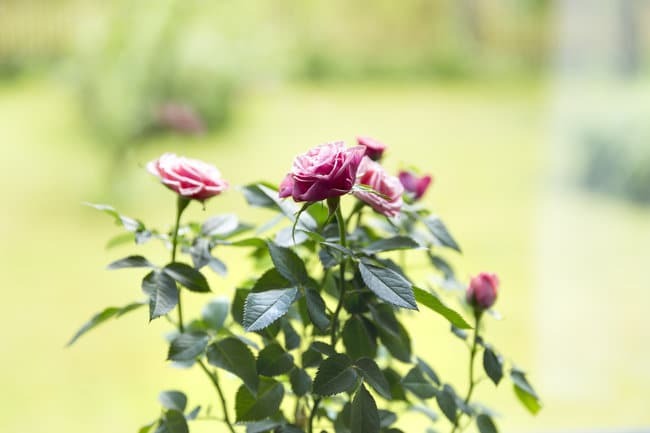 Miniature roses require frequent watering, but they can be susceptible to root rot and fungal infections, so you have to be mindful to avoid allowing them to sit directly in water. Allow the soil to dry out between watering to ensure you avoid these problems. Test the soil with your finger prior to watering. If you can put your finger one inch into the soil and it’s dry, it’s time to water. If your finger encounters any moisture, wait another day and test again prior to watering your miniature rose. Always make sure to water your miniature rose from the soil level. Avoid allowing water to touch the leaves or the blossoms as this can cause damage to the plant. Water your miniature rose until the water runs out of the bottom of the planter. Allow the excess water to drain away before placing the miniature rose back on its drip tray. Sometimes I put pebbles in my drip tray and set the pot of roses on the pebbles. This allows the water to continue to drain freely out of the pot, and avoids the possibility of the roots sitting in water. What Soil Do Miniature Roses Need? Avoid using soil out of your garden as this can contain pests and fungi that may affect your miniature roses. Choose a high quality potting soil mix that has perlite and compost incorporated into the mix. The perlite is an organic lava rock that will improve drainage and the compost is decaying organic matter that will feed your miniature roses and encourage more growth. I would definitely recommend fertilizing your miniature rose on a regular basis through the warmer months of the year. This will encourage growth of new foliage and flowers and help your miniature rose to stay healthy. You should fertilize your miniature rose every 2-4 weeks from early spring through to mid autumn depending on your climate. I tend to use a water soluble fertilizer and dilute it to approximately half the suggested strength. This will prevent a build up of nutrients salts in the soil, which can cause your plant major problems. 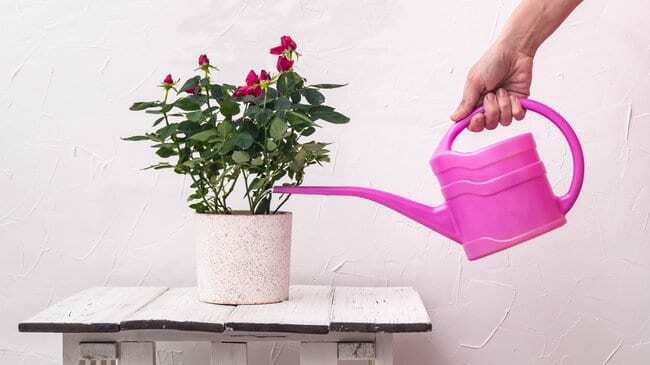 Always remember to water your plant at least 1-2 times in between fertilizing to flush the soil of any build up of nutrient salts. Select a fertilizer that is designed for houseplants and well balanced. You can choose a liquid or a pellet type fertilizer. Make sure to follow the instructions closely. Miniature roses thrive on high humidity. A great way to do this is to place your miniature rose planter on a tray that is filled with pebbles and has water partially covering the pebbles. Make sure the base of the pot doesn’t sit in the water though. The water in the tray will evaporate slowly, increasing the local humidity around the rose plant. Roses thrive in warmer weather. They don’t like it too hot, but prefer a temperature of between 65 to 75 °F during the day. They also prefer that it not get below 60 °F at night. If the temperature drops below 50 °F the plant may enter its dormancy phase and stop producing flowers. Whilst you don’t want his to happen for the majority of the year, it is actually essential to expose an indoor miniature rose to colder temperatures for at least 6 weeks of the year in late autumn and winter. This is best done by moving the miniature rose to a colder room, a well lit garage, greenhouse or even outside in milder climates. The colder temperatures may cause leaves and flowers to drop. Whether this happens or not, it will trigger a period of dormancy for the plant, which is essential to prepare the plant for the development of new foliage and flowers in the spring. Miniature roses are very hardy plants, so don’t worry about exposing your plant to mild frost while it is outside. As long as the temperature stays above -10 °F, your roses should survive cold winter nights without issue. 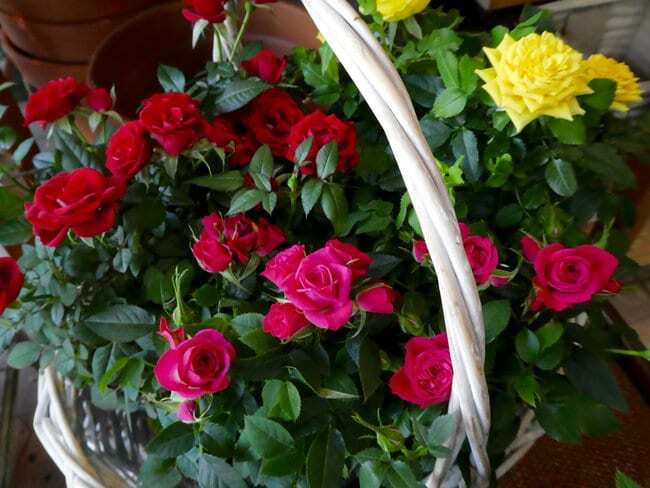 Depending the particular type of miniature rose plant, you may have simple flowers, semi-double flowers, double flowers, single flowers, clustered flowers, odorless flowers or very fragrant flowers. They also come in a wide array of colors from creams and whites to yellows, golds, two toned colors, deep reds and burgundy’s, nearly black, blues, pinks and nearly every other imaginable color in between. Most miniature roses will bloom for many months of the year as long as the plant is happy with its growing conditions. Be sure to deadhead or pinch the spent flower blooms back after they’ve bloomed to encourage more flowers to come on. If you have a particularly fragrant variety, you’ll notice more fragrance when you have more blooms. Always remove spent blossoms to encourage more growth of the plant. I tend to dead head the flowers throughout the year and do some minor pruning to keep the plant looking well. However, it is during the winter dormancy that you will need to do the most significant pruning. While it may seem like you’re harming your plant by doing this, it will direct the nourishment and water to the other areas of the plant. Plants that are properly pruned will be stronger and produce more flowers during the next growth phase. All you will need to prune your miniature rose is a pair of sharp pruning shears, and ideally, some gardening gloves to protect your hands from the thorns. I would also recommend using some rubbing alcohol to sterilize the blades of your shears. 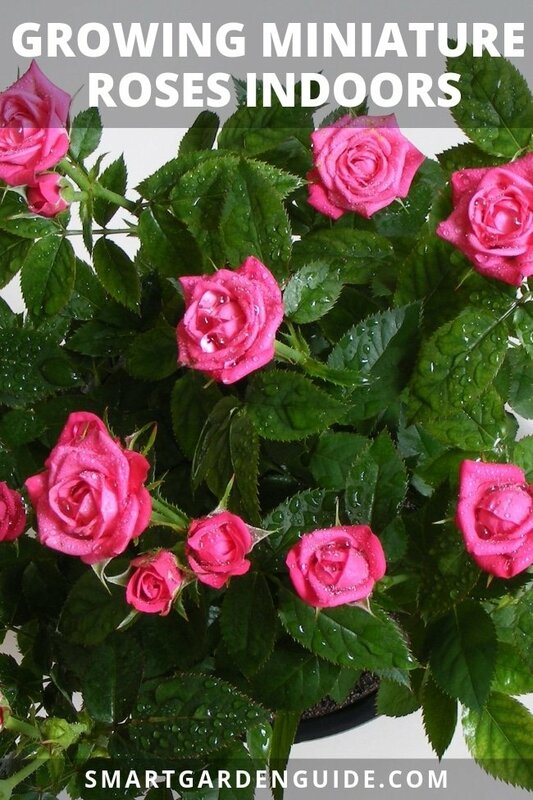 Start by removing any dead or dying growth on the miniature rose plant. Prune back any stems which cross each other, particularly those in the center of the plant. Crossed stems can damage each other and removing these will increase light penetration into the center of your plant. Next prune the other healthy stems back. These should be pruned back to just above a five leaflet leaf set. This is a good idea as it will provide a good platform for new healthy growth. Don’t be afraid to prune more than a third to a half of the plant growth back. Miniature roses are normally hardy and don’t mind a good trim. Try to maintain the symmetry of your miniature rose as you prune it as this will lead to a more attractive plant when new growth starts. Check out this useful video on pruning miniature roses. It covers the basics really well. You may want to consider re-potting miniature roses that you’ve purchased from a store. You don’t know what the plants were exposed to at the store so you want to give them the best possible start in your home. Choose a high quality potting soil mix and add in some perlite and compost. Select a planter that is wider than it is deep. Make sure that the new planter has plenty of drainage holes. If it doesn’t, add some in. Layer some rocks or pebbles on the bottom of your planter to ensure proper drainage. Brush off as much of the dirt from the previous pot as possible. You may wish to use a clean and dry paintbrush to do this so that you can remove as much of the old soil. There are many factors to successful propagation. It will depend on the particular growing medium, type of miniature rose, and the temperature. This is a “trial and error” type of thing. Not all miniature roses lend themselves well to propagation. To attempt propagation, wait until the rose has bloomed and the flower is spent. There should be at least three or four healthy leaves on the stem. You need to use your sterilized pruning shears or a sharp pair of sterilized scissors and remove the spent bloom from the top of the stem. Go down approximately four to six inches on the stem and make a sharp cut at an angle. Dip the raw end into some organic local honey. The honey protects the raw end from dying, root rot, and molding. Now place your cutting into a growing medium. Within four to six weeks you should see your new start begin to grow. If it doesn’t work the first try, take heart, even the most famous horticulturists have struggled with this. Simply try again with another stem from another spent bloom and keep trying. Eventually you’ll get the hang of it and be able to propagate a new plant. Spider Mites: Indoor miniature roses are especially prone to spider mites. Carefully look your plant over each week and inspect it for these tiny pests. If you see any, spray the plant with an insecticide or remove the spider mites with a paper towel that is dipped in some mild soapy water. Be sure to inspect both the tops of leaves and the bottoms. Aphids: Just as the spider mites, these little critters can also wreck havoc on your indoor plants. Inspect your plants for these at least weekly. Again, you can remove them with insecticide, mild soap and water and a dampened paper towel, or you can bring in some lady bugs who will enjoy dining on the critters (or if the weather is warmer set the plant outdoors and go find some lady bugs to dine on the aphids. Fungi: Leaf conditions such as black spot, powdery mildew and rust are all forms of fungus. Make sure to space plants at least a foot from other plants to help reduce the risk of fungi. Always water the plant from the soil level and avoid getting the foliage wet as this can cause molds and mildews to form. Remove and get rid of any of the foliage that displays any form of such conditions. Another cause of fungi is non-sterile equipment such as scissors or pruning shears. Always take the time to sterilize your pruning shears or scissors prior to doing any pruning to ensure no exposure to fungi. Miniature roses are not typically toxic to cats, dogs, or humans. However, care should be taken to avoid injuring oneself on the thorns and for some more sensitive individuals or pets ingesting the foliage or flowers may cause mild intestinal distress. How large will my miniature rose get? Indoor miniature roses come in a wide array of shapes and sizes. They may only get as big as six inches, or they may grow as large as two feet. The average size of a miniature rose plant is 12-18 inches in height. How frequently should I water my miniature rose? Water your miniature rose at least weekly and more often in warmer weather. Avoid watering until the soil is dry when you press your finger into the soil. Due to their shallow root systems they will require more water than many other houseplants. If the leaves are turning yellow or look to be wilting, you probably need to water them more frequently. Since Miniature roses require high humidity should I mist my plant? No, never mist or spray water on your plant directly, this can cause leaf rot, molds and mildews. To increase the humidity, use a humidifier in the room, or place your planter on a tray filled with pebbles and water. The plant will then absorb the moisture up into the plant and humidify itself that way.